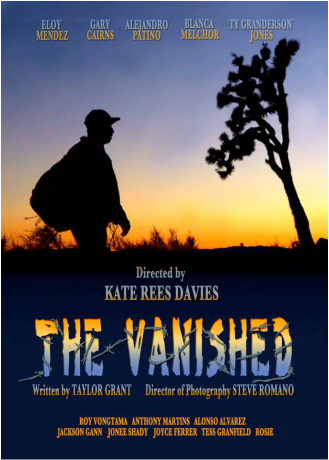 The Vanished premiered at the prestigious Short Film Corner of the Cannes Film Festival. It was also selected as a finalist at the Houses of Parliament in London, and received distribution through Sony's 4K TV launch, as well as an appearance at NAB in Las Vegas. The Vanished was also scooped up as an "Editor's Pick" on SHORTS TV, which has an international audience of 11 million subscribers and growing. This film puts a human face on the countless children, mothers, fathers, and grandparents who have died tragically while simply trying to earn an honest wage and feed their families. Directed by award-winning director Kate Rees Davies and features Alejandro Patino (Iron Man 2, Weeds, Desperate Housewives), Gary Cairns (Criminal Minds, Justified), Eloy Mendez (NCIS, The Shield), and Ty Granderson Jones (Con Air, ER). Taylor is the director, screenwriter, co-producer, and star of The Muse, a psychological thriller also starring Jake Eberle and Sasha Perl-Raver. The Muse is a terrifying psychological thriller about a horror novelist named Gabriel Hunt who is both inspired and tormented by a dark muse. His latest work-in-progress is shaping up to be the best of his career, and yet the muse that flames his brilliance is simultaneously driving him mad. With the completion of each page of the manuscript, he seems to lose one more piece of his sanity–and he doesn’t know whether the horrors of the book are manifesting in reality—or the reverse. Gabriel fears that the closer he gets to ending his latest book, the closer he is to ending himself.